Brighten a kitchen counter and other workspaces with under cabinet lighting. 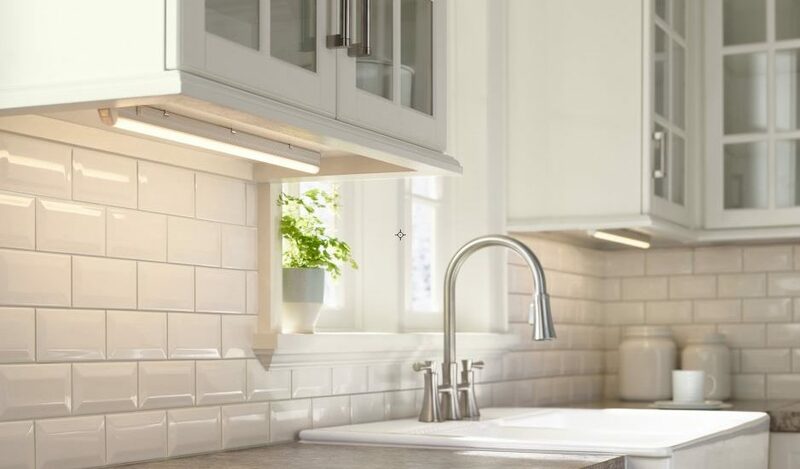 Along with a brief video, this complete Lamps Plus guide provides everything you need to know to find the right under cabinet lighting for your space. Ready to shop? 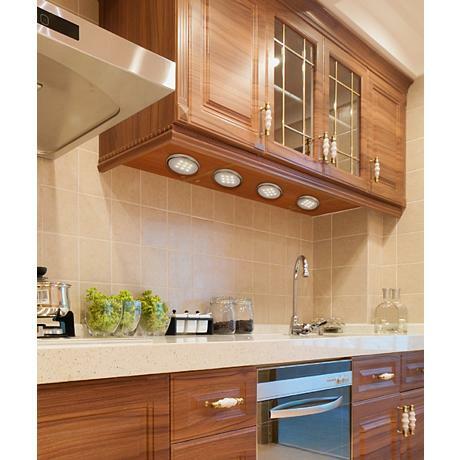 You can shop our entire line of under cabinet lighting here. Unobtrusive and sophisticated, light bars provide a lot of light while staying out of sight. Under cabinet light bars offer the most professional look, providing even, uniform light that’s perfect for kitchen tasks. 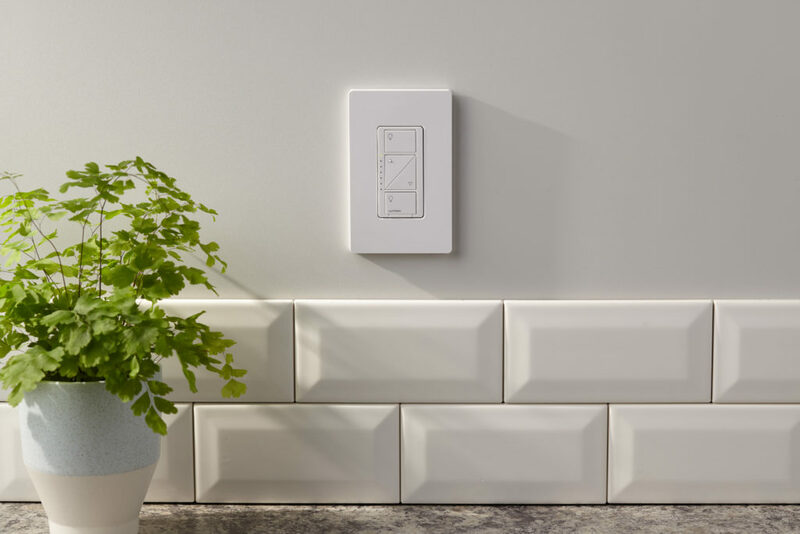 They can also be linked together using connectors or linking cables, so that your entire lighting system can be operated on the same switch or dimmer. A quick solution to add a focused light to the under cabinet area. If you’re looking for a solution that provides a more focused “pool” of light all while adding both drama ambiance, then you should consider purchasing under cabinet puck lights. They’re also available in small battery-powered models that are a perfect DIY solution for use in pantries, cupboards, bookcases and closets. 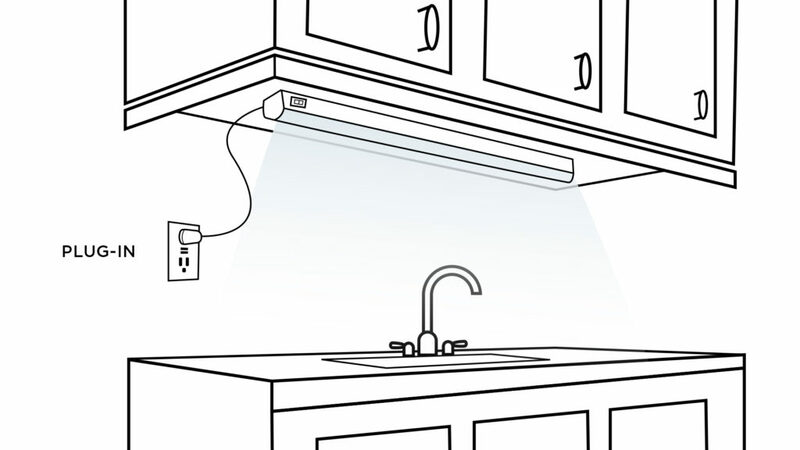 A plug-in tape light can change the mood of the kitchen, and it’s easy to install. Tape lights, sometimes called strip or rope lights, are an affordable, easy-to-install option. They have a very shallow profile too, allowing them to fit in small spaces. Plus, many can be cut to size and simply adhered to the underside of cabinets, installed under a toe kick, or even used outdoors for decks. First, make sure your lights are shallow enough to stay hidden behind the cabinet face. A simple measurement is all it takes to confirm the fixture will tuck neatly out of sight into the lip of the cabinet. For best results, choose a finish that closely resembles your cabinets. To ensure even lighting across the counter, use light bars that closely match the width of your cabinets. If you’re using puck lights instead, place them 8-12″ apart for even light distribution, or space them out further to create pockets of light. QUICK TIP: Mount fixtures close to the front of your cabinets to get the best possible distribution of light across the counter. Next, think about how you want to power your lighting: Plug-in or Direct Wire. Many product families are available in either. 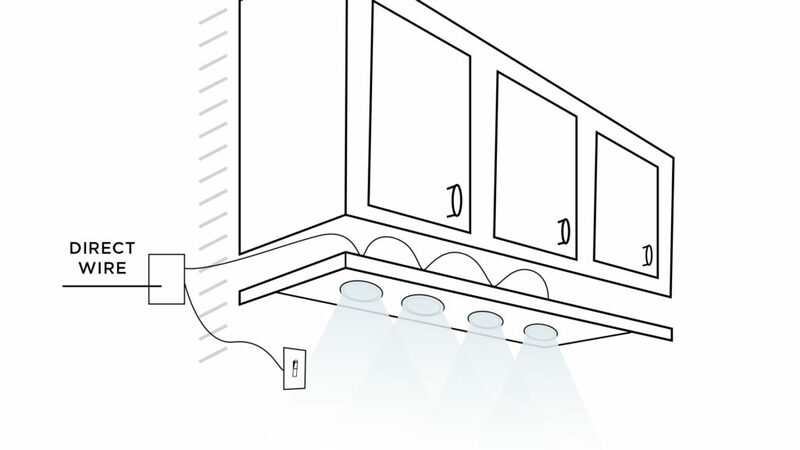 • Plug-In Under Cabinet Lights: These designs are easy to install. Simply place them, plug them in, and enjoy! 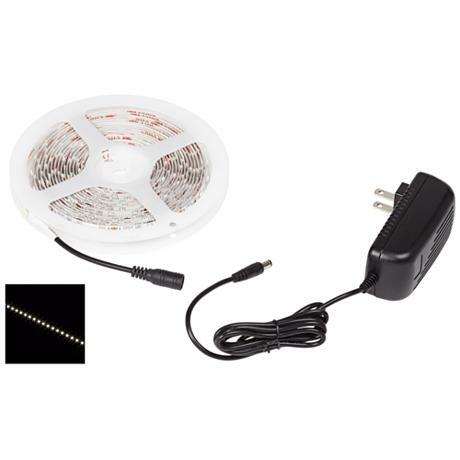 Plug-in lights are easy to set up and don’t require professional installation. • Direct Wire Under Cabinet Lights: Hardwired into your home, direct wire offers a professional solution that can link all your lights together on a single switch or dimmer. However, direct wiring also requires some know-how – or the help of a licensed electrician – to install. A professional electrician can help you install beautiful direct wire under cabinet lights. QUICK TIP: Use fixtures from the same brand and-or product family if you want to link multiple light bars or pucks on the same power source or switch. 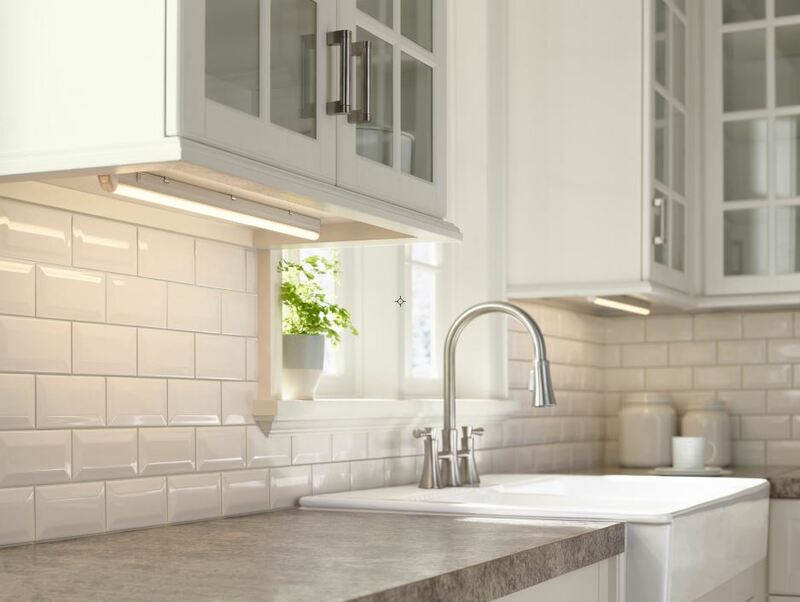 By far the most versatile, popular and practical choice is LED under cabinet lighting, but there are a number of other options available too, including fluorescent, xenon, and halogen. LED lighting is also the most energy efficient and long-lasting. Moreover, because it emits very little heat when on, it is perfect for use under kitchen cabinets, where food may be stored. Best of all, LED can produce a range of colors, from warm to cool. • Remote Controls: Some under cabinet lighting is operable by remote control, offering features like on/off, dimming and color-changing functionality. • Dimmers: Putting under cabinet lights on a dimmer allows you to brighten them for tasks like meal preparation and dim them for ambience. Keep in mind that not all systems are dimmable, however. See individual products for details. Add a dimmer to regulate the light and set the mood. • Outdoor Use: Some rope and tape lights are suitable for both indoor and outdoor use, making them an easy way to light outdoor kitchens, covered workspaces and more. See individual products for details.